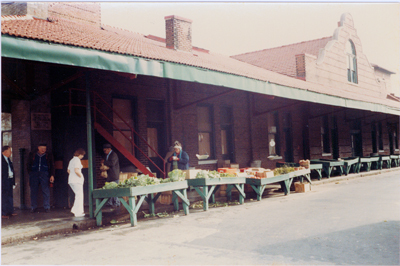 Although the heyday of Raleigh’s City Market had been in decline for years before I snapped this photo on a slow day in the mid-1970s, it continued to serve downtown Raleigh as an open air produce venue for the remainder of that decade. Following a city-funded renovation in the early 1980s, Greenshield’s Brewery and Pub moved into the market building in 1989. The popular restaurant and brewpub occupied the space until a fire closed them down five years ago. It has been vacant ever since. Last year, Showtime Events, a “full service event production and entertainment company,” announced it would be opening “Cobblestone Hall” in the City Market building. My understanding is that they would cater to a variety of “closed,” private activities, such as wedding receptions and corporate events. 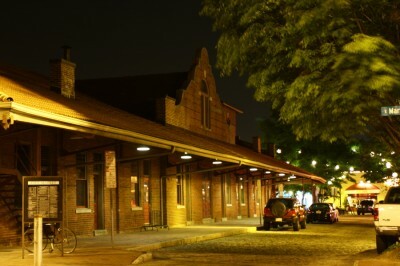 Utilized in that fashion, the historic building would thereby lose its function as a public space for the community, as an integral component to a very public park — Moore Square. Showtime Events initiated a makeover last fall, and the interior of the building was gutted down to its original white tile walls and concrete floor. That was months ago, and I haven’t noticed any activity at all down there since then. Looks like just another slow day at City Market to me. I, for one, would rather have the produce vendors back. I noticed some construction work being done less than two weeks ago, but didn’t peek inside to see what was taking place. I agree that using this space for closed-door events seems odd, given its history and proximity to Moore Square. I know the City Market area is already a difficult venue for a retailer to operate out of, but using it for this just seems like a waste to me. It is a real shame if the City Market building is used for “closed events”. That whole area needs more businesses that will draw the general public. Before Greenshields the building was used as a food court and stayed busy. I would rather see it return to something of that order. Maybe City Market should take a cue from Reading Terminal or DC’s Eastern Market?